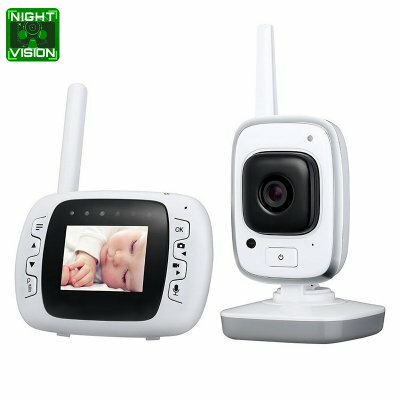 Successfully Added Baby Monitor - 2.4G Wireless, 300m Transmission Distance, 32GB Internal Storage, Dual Way Audio, Temp Monitor, 3M Night Vision to your Shopping Cart. Keep an eye on your sleeping beauty with this High-End baby monitor. Thanks to its 2.4G wireless connection, this nanny cam can be easily installed and used with the included display without the need for any cables. From now on, you’ll always be able to see what’s going on in your child’s bedroom even when you’re in another room. Thanks to its built-in microphone and speaker, this baby monitor will let you know when your baby has woken up. Additionally, it supports two-way audio communications that allow you to say some sweet words to your baby before falling asleep. With a wireless transmission distance of 300m, this nanny cam can be used efficiently in any household. Thanks to its encrypted wireless connection, this nanny cam brings along great security and privacy. The camera has been equipped with a 1/4-Inch CMOS sensor that is capable of producing clear 480p footage. With a 60-degree viewing angle, this baby monitor allows you to keep a clear overview of all that’s happening in your child’s bedroom. Your nanny cam has even been equipped with IR LEDs that bring along 3m night vision capabilities. Thanks to this, you can keep an eye on your beloved son or daughter even after dark. The main unit comes packed with 32GB of internal storage to store previously recorded video. The monitor of your babyfone features a compact 2.31-inch display. On this screen, you’ll be able to enjoy 240p footage of your sleeping baby. It runs on regular AAA batteries (not included) which can be easily replaced. Added to that, the nanny cam features a compact and lightweight design. This allows you to easily carry it along and place it anywhere in your household. With its 1W built-in speaker, you’ll always be able to hear when your baby is in distress or has woken up from his afternoon nap. It even allows you to play lullabies to sing your beloved child to sleep. It furthermore supports temperature detection to make sure your child never gets too hot or cold. This baby monitor comes with a 12 months warranty, brought to you by the leader in electronic devices as well as wholesale electronic gadgets..